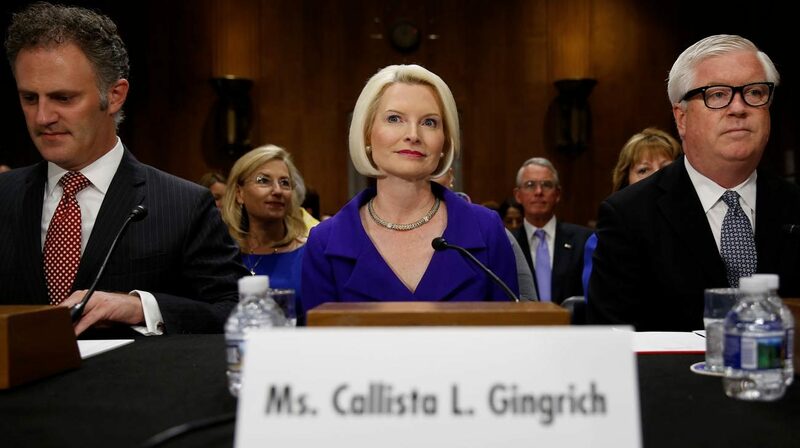 WASHINGTON (CNS) — Callista Gingrich testified before the Senate Committee on Foreign Relations July 18 for her confirmation hearing as President Donald Trump’s nominee to be the U.S. ambassador to the Vatican. Gingrich, 51, affirmed the administration’s commitment to protecting human rights and religious freedom and responded to questions about refugees and the environment. Sen. Ron Johnson, R-Wisconsin, presided, introducing Gingrich and referencing her involvement with the Catholic Church. He noted that Gingrich was the organist for her local parish, St. John’s Catholic Church, in her hometown of Whitehall, Wisconsin, and has been a longtime member of the choir at the Basilica of the National Shrine of the Immaculate Conception in Washington. “Callista is a lifelong Catholic and has been active in her faith for many years,” Johnson said. He marked her almost three decades of experience as a congressional staffer and subsequent work as president of Gingrich Productions, a company that produces documentaries, books, newsletters, and other materials related to history and public policy. Johnson noted that Rep. Francis Rooney, R-Florida, who served as U.S. ambassador to the Vatican from 2005 to 2008, was in attendance in support of Gingrich’s nomination. In her testimony, Gingrich emphasized her desire to work with the Vatican to protect religious freedom and human rights, fight terrorism, violence and human trafficking, and seek peaceful solutions to international crises. After Gingrich and other nominees delivered their testimonies, members of the committee questioned them. Questions for Gingrich focused primarily on refugees and the environment. Sen. Jeanne Shaheen, D-New Hampshire, said that Pope Francis has called upon America and the rest of the Western world to welcome refugees and asked Gingrich how she planned to work with the Holy See on this critical issue. “We have a deep commitment in this country to work so that people don’t have to become refugees,” Gingrich said. Sen. Tim Kaine, D-Virginia, pressed the question further, noting that the president’s most recent budget proposal included a cut to the refugee bureau. “We’re sending a message,” Kaine said in reference to such cuts. Sen. Chris Murphy, D-Connecticut, also referred to the budget, alluding to a hiring freeze for the State Department. “You are all going to feel the brunt of that,” Murphy said to Gingrich and the nominees for other positions who were present at the hearing. Sen. Tom Udall, D-New Mexico, asked Gingrich if she planned to work with the Vatican to increase ties between the U.S. and Cuba. Gingrich replied that she hopes to aid in efforts to advance religious freedom, human dignity and human rights in Cuba. “The pope and the president share a great concern about the environment,” Gingrich said. Merkley said that he “must have missed” any of the president’s statements showing his dedication to the environment. With questions from other committee members ended, Johnson asked Gingrich about her experience producing “Nine Days that Changed the World.” Gingrich responded that her work affirmed that Pope John Paul helped usher in end of communism in Poland and Eastern Europe. After Gingrich’s answer, Johnson concluded the hearing. “America has been a phenomenal force for good in the world; the Catholic Church has been a phenomenal force for good in this world,” Johnson said. If confirmed, Gingrich, wife of former House Speaker Newt Gingrich and a former congressional aide, will become the 11th U.S. ambassador to the Vatican. She would succeed Ambassador Ken Hackett, who retired in January. She would be the third woman to serve in the post after Lindy Boggs, who served 1997-2001, and Mary Ann Glendon, who served 2008-2009. The ambassadorship began in 1984 with the official opening of diplomatic relations between the United States under Ronald Reagan and the Vatican under Pope John Paul.